Daily Zohar # 1001 – Why are you hungry? The ‘head’ of Arich Anpin has three levels of light that connect to the Endless light. 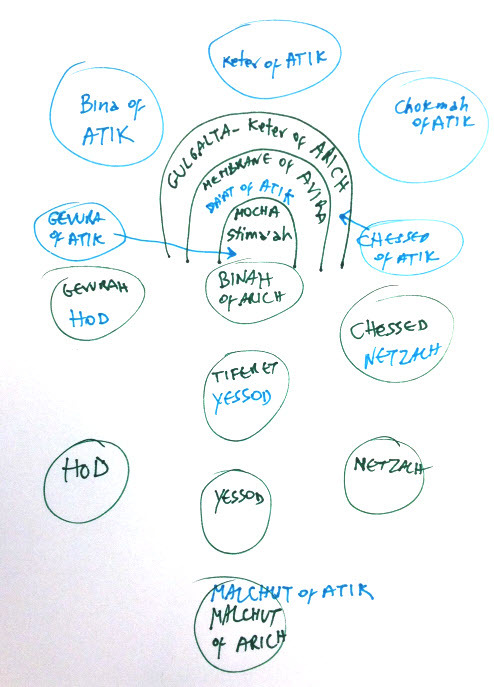 The drawing below is very general just to show you the relationship between the two heads of Keter, ATIK and ARICH. ATIK was ‘copied’ from Adam Kadmon and the Endless Light. It is one and all mercy. Its next phase is ARICH where we can begin to see the formation of the aspects of male and female (not shown below). The process in Keter created the ability to continue the construction of the worlds and channel the Endless light to the lower levels. The Zohar teaches us that even though Keter is the highest Sefira with the most fine lights, it is still considered ‘dark’ in relation to the levels above it and the Endless. The 10 Sefirot represent the process of evolution from Endless light to matter in the physical world. Each level brings forth the level below it by creating a vessel for it. The upper Sefira ‘pushes’ its light down to form a vessel then goes back up leaving light for all the levels below it. Chokmah has the light of nine Sefirot, itself and the eight below it. Chokma has no real lack because it receives all the light of Keter, which is only a root of all. Binah has the light of the eight Sefirot below. Binah begins to experience desire to spread light that was inherited to her from Chokmah. The process continues in the lower levels until we arrive to Malchut that is left with out light BUT with the biggest desire of all. Malchut has the ‘taste’ of all the Sefirot of light above it and is in constant hunger. Having desires to the material things is like consuming our own vessels and that makes them breakable. When we use the material existence to expand our vessel and desire the light, we grow spiritually and our souls can reach higher levels.